Charging devices with the power of the sun is the ultimate in green energy. 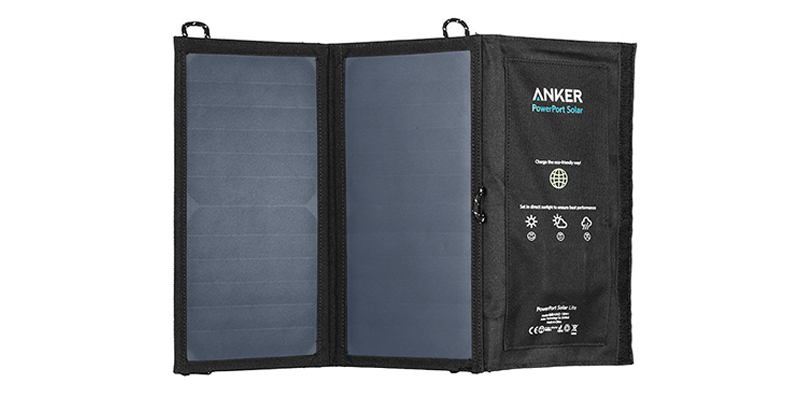 This solar charger from Anker, one of America’s leading USB charging brands, allows you to safely charge devices using advanced technology off the grid while enjoying the great outdoors. To take advantage of this free limitless power all you need to do is spread out the solar panels or attach the device to your pack, then you can start recharging all your mobile gadgets for free, anywhere! This Anker charger uses exclusive fast charging technology called PowerIQ, this system discovers and replicates your device’s original charging protocol thereby accessing the fastest possible charging speeds of up to 2.4 amp per port, assuming there is enough direct sunlight. This compact device folds down to just 11 x 6 inches and weighs just 14 ounces. There are stainless-steel eye-holes on each corner for attaching the charger to a backpack or tent, plus it easily fits into a travel bag or daypack. Constructed from tough PET plastic, the solar panels are sewn into rugged polyester canvas to ensure reliability on your outdoor adventures. The charger is easy and safe to use with all portable devices too, with short circuit and surge protection technology as standard to keep you and your gadgets safe. This 2-Port USB Solar Charger is compatible with the iPhone 6 and 6 Plus, iPad Air 2, iPad mini 3, Samsung Galaxy S6 and almost all other smartphones and tablet devices. The charger itself can also be recharged – if no sunlight is available – using the included 3ft Micro USB cable. But in direct sunlight optimal conditions, the Anker PowerPort Solar Charger can produce up to 3 amps and charge two devices simultaneously. Finally, for complete peace of mind, Anker products all come with an 18 month manufacturer warranty. Compatible with Apple and Android smartphones, tablets (including the Nexus 7) and other USB-charged devices except for the iPod nano, iPod Classic, HP TouchPad and Asus tablets.